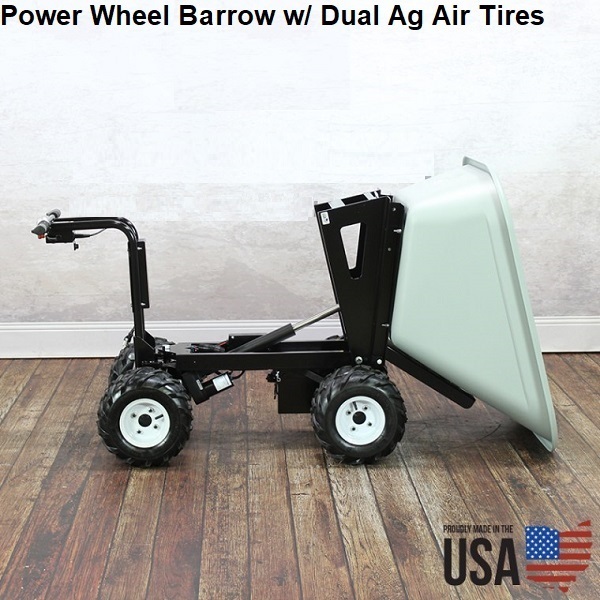 This new and updated 4 wheel power drive and dump - 10 cubic foot wheelbarrow dump cart features an articulating chasis for easy and easy manuevering in tight spaces. 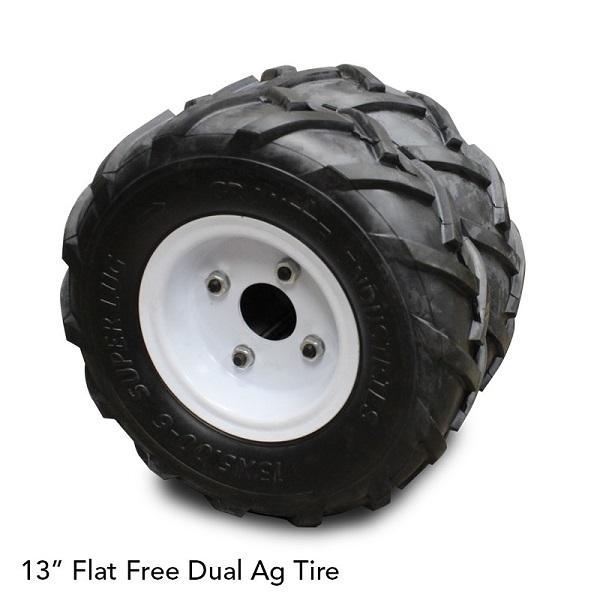 It is perfect for farms, landscaping, nurseries, parks, and backyard improvements. 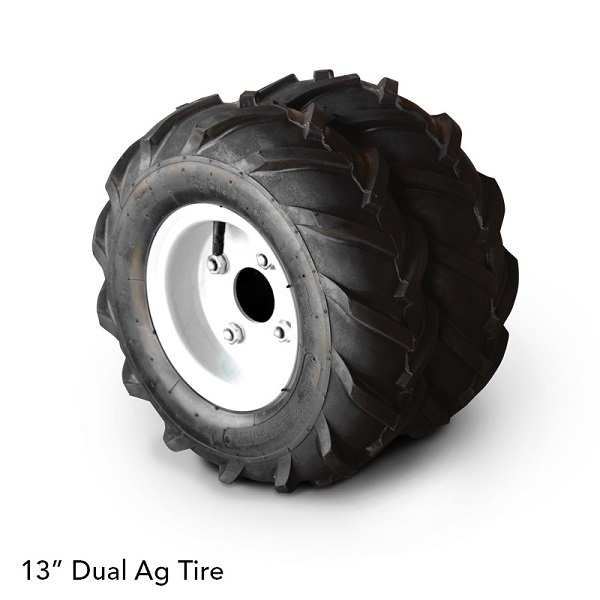 The big dual 13" all terrain tires (total of 8 tires!) ensure a smooth ride even over rough surfaces. Easier and safer to use than a wheelbarrow, while saving your back! 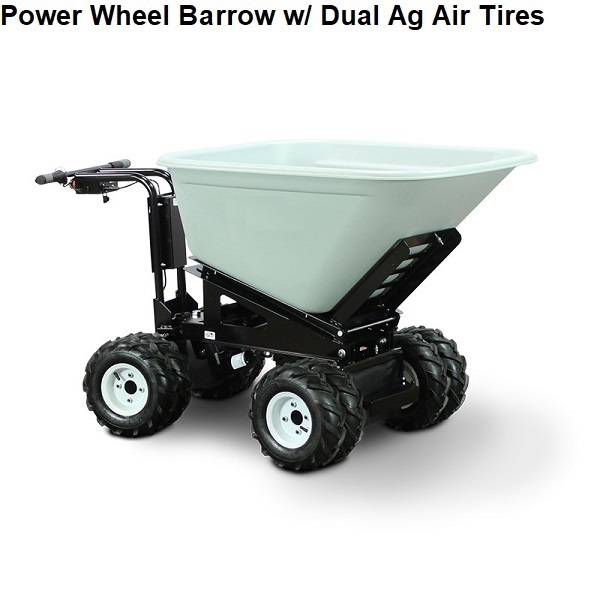 This electric wheel barrow is completely electric - power drive and dump! It emits no fumes and makes virtually no noise. Come sun or rain, you are able to get your work done - indoors or out. Everything on the power cart is splash proof sealed, so bring on the rain and the mud! However, do not drive them through deep water. 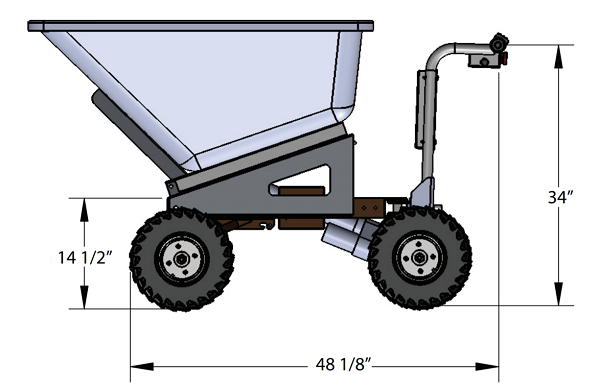 This power dump cart operates from approximately 0 to 2.4 miles per hour forward, and 0-2.4 miles per hour in reverse. 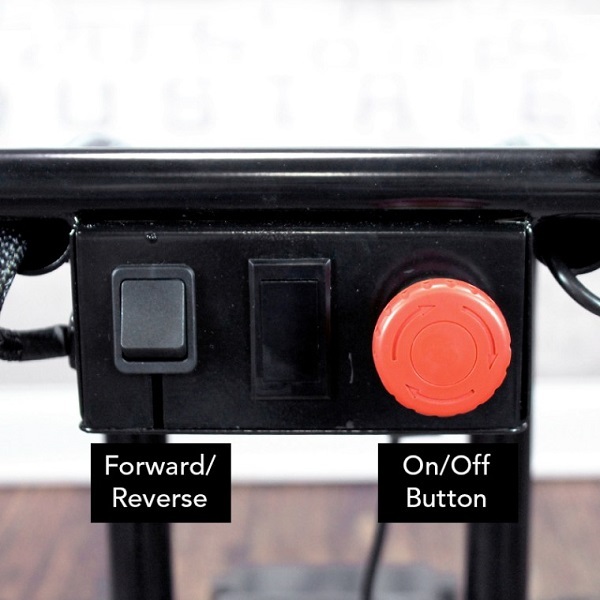 Safety is key, and our motors are built to prevent the cart from unintentional movement. When the brake is engaged, the cart will hold on an incline. Brakes can be manually disengaged for freewheeling. 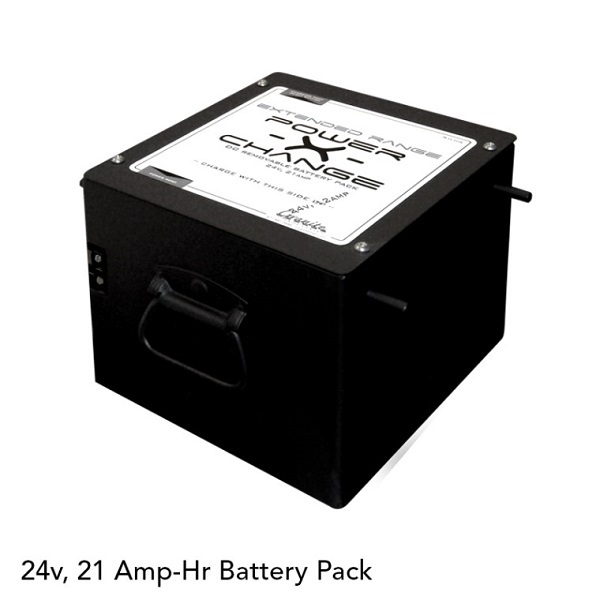 Other safety features include an overload trip breaker designed to stop the unit before damage to the electric motor occurs. 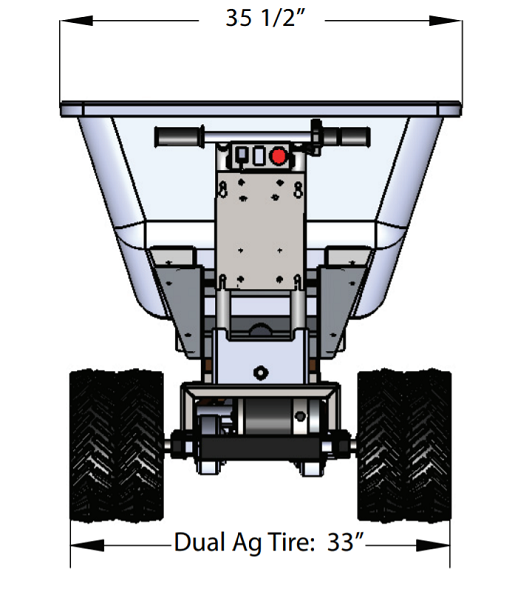 The drive system is a sealed differential that allows the machine to efficiently make turns without skidding the tires. Plus it’s sealed for life, thus no lubrication is required, and there’s no extra maintenance required either: no oil changes, no replacing chains or belts. Simply remember to always recharge your cart when not in use. Disadvantages: throttle kind of hard to keep under control until you get the hang of its operation. Love our truck! We named it Brutus because it goes in mud like no other product before it. Helps cut down our time for mucking our stalls. Wish we got it sooner . Staff was totally awesome to work with! Disadvantages: Wish we would have replaced the standard tires with mud tires upon purchase. I purchased this machine to enable me to transport manure and gravel in my commercial rabbit operation. A completely full load will weigh well over 500 pounds. This machine easily does the job and makes it possible for a 65 year old man to continue to operate a farm that would not be possible without it. Advantages: The electric motor is powerful and reliable. 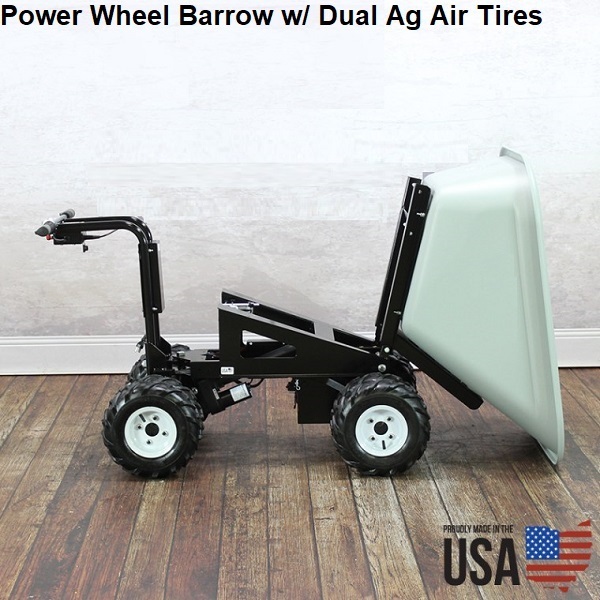 The four wheel drive makes it possible to transport heavy loads through mud and manure. 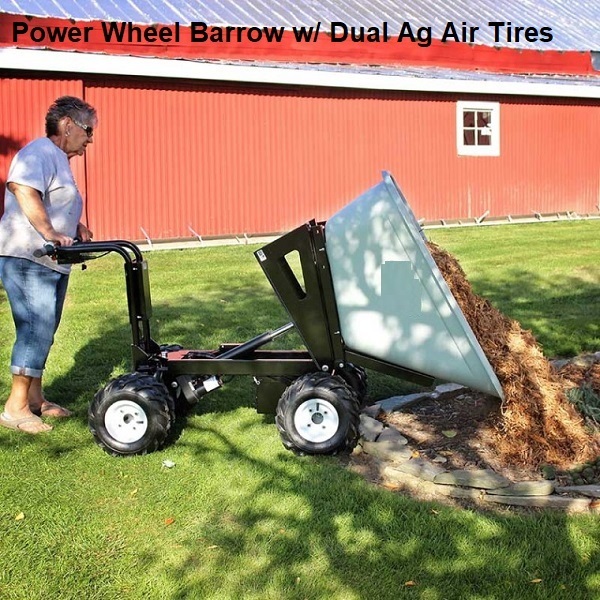 The power dump feature in great to unload wet loads without scraping out with shovel or broom. Disadvantages: There are only two things that I would improve. 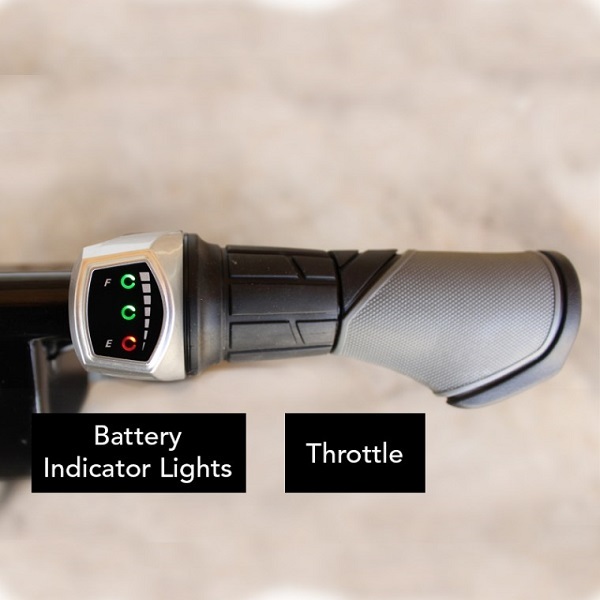 First is the speed control throttle, it is a little difficult to get a medium steady speed on long hauls, seems like it is either slow or too fast. Secondly is that turning is somewhat difficult. 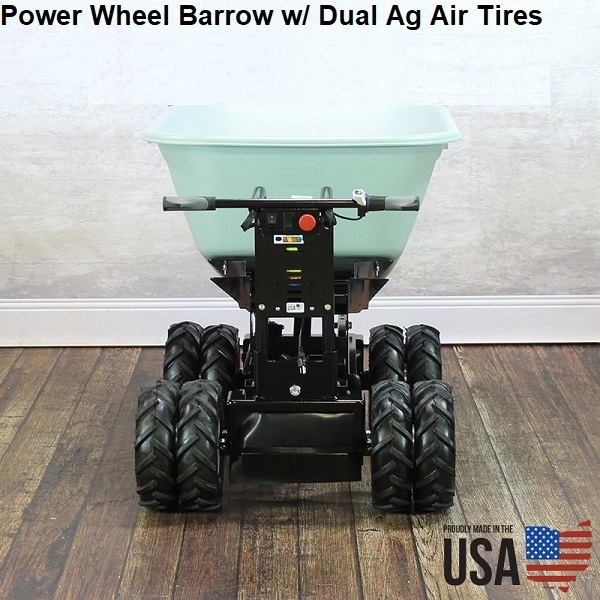 But overall, the good easily outweighs the bad and I am very satisfied with this wheelbarrow and have already ordered the 8 cubic foot, manual dump model to use as a feed cart.